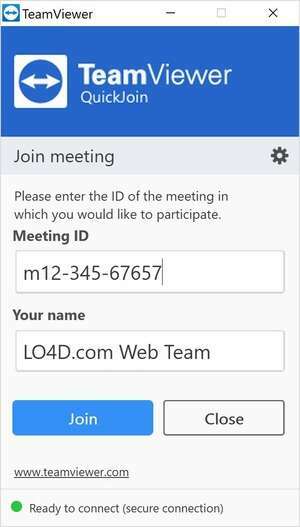 TeamViewer QuickJoin is a useful application which allows you to participate in online meetings and presentations. With the invitation function, you can now send the session data to your participants ahead of the session. The participants now connect with you via the application and not the other way around. This saves you from entering the data of every single one of your participants. Version 14.2.2558.0 is a freeware program which does not have restrictions and it's free so it doesn't cost anything. For security reasons, you should also check out the TeamViewer QuickJoin download at LO4D.com which includes virus and malware tests. Additional screenshots of this application download may be available, too.